The first stop will be in a hidden gem not found in any guidebooks you’ve seen. Magnificent Llanos del Cortez waterfalls, surrounded by a sandy beach and lush rainforest, where you can swim and relax. After the refreshing swim, you will stop at LAS PUMAS WILDLIFE RESCUE CENTER, where you can see: Jaguars, Cougars, Ocelots, Macaws, Monkeys, Toucans and More!! We will then drive for 45 minutes to enjoy a typical lunch. 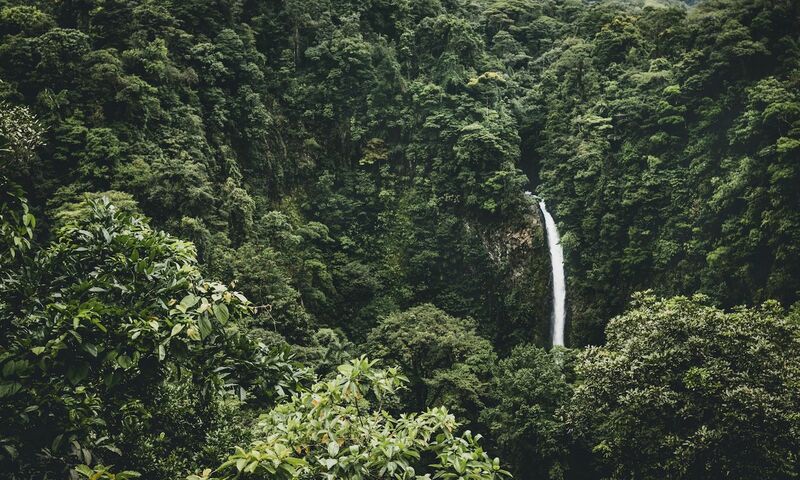 Then, located on the slopes of the Tenorio Volcano, there will be a two-hour hike with many stops to see the variety of flora and fauna in the surrounding TROPICAL RAIN FOREST with 4 hanging bridges over the forest canopy ranging from 35 to 40 meters in height. This hike is an excellent opportunity for observing Birds, Butterflies, Bromelias, Orchids… and become immersed in THE SPLENDOUR OF THE TROPICAL JUNGLE. The last activity will be the visit to a Botanical Garden to see a variety of colourful species of frogs. luck, we may spot a sloth or two. Recommendations: Hiking shoes, light clothing, ponchos, binoculars, insect repellent, cameras. Pick up: 7:15am at the door of your villa.